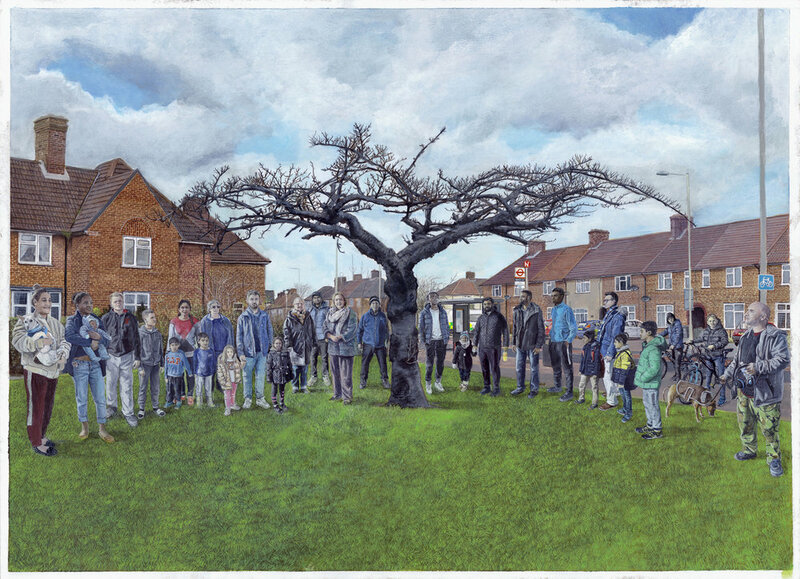 ***Invitation to people who were depicted in Wouter Osterholt’s tree paintings between November 2017-March 2018 on Walnut Tree Road, Valence Avenue and Warrington Road. Exactly a year after his residency at The White House ended, Wouter Osterholt will return to present his project "Beacon Tree" in March 2019. During his residency, Wouter inhabited and occupied green public spaces across the Becontree estate to produce three paintings of trees on Walnut Tree Road, Valence Avenue and Warrington Road. Wouter set up his easel on these public sites and painted, using this process to engage over 80 local residents in conversation about the area. Whenever passersby approached him during his painting sessions he portrayed the people gathering around the trees in his paintings. Wouter is now inviting residents who were depicted in the paintings, along with their family and friends, to The White House for a celebratory gathering, effectively re-staging the paintings on Saturday 30th March, 3-4pm. The gathering will be a chance to view the exhibition of original paintings, collect your own printed copy of a painting and share in a conversation to imagine a storyline that could ‘explain’ the reason for the scene depicted in the painting and the gathering under the tree. These conversations will then inform a number of new plaques installed at sites around the neighbourhood featuring the paintings and various narratives of residents and their visions for the future of Becontree estate. Dutch artist, Wouter Osterholt undertook an International residency at The White House in November 2017 - March 2018 in partnership with V&A Research Institute (VARI). During his residency, Wouter explored the utopian origins of the garden city movement so as to re-imagine new models of communal living within Dagenham's Becontree Estate, allegedly the biggest municipal housing project in the world. As a starting point he looked at the meaning of the name 'Becontree', as recorded in the Domesday Book of 1086, which derives from the words 'Beacon' and 'Tree'. The original tree indicated the location where early hundred meetings took place. For more information about Wouter’s residency please click here.